THERE is more than one way to achieve dreadful public policies. Committees of bureaucrats have crafted real stinkers over the years. Other duff laws are the work of deep-pocketed special interests. But to create the worst government programmes—schemes that combine brow-furrowing folly with gasp-inducing expense—few methods are as sure as inviting Congress to spend the money of future taxpayers, in order to pander to public sentiment today. For a case in point, consider the Wild Horse and Burro Programme of the Bureau of Land Management (BLM). 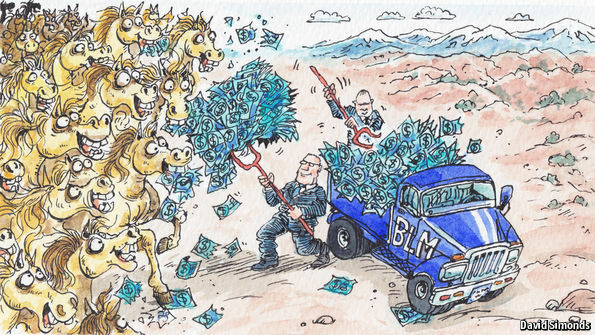 The BLM, a federal agency which manages more than 245m acres of public land, is a whipping-boy for the environmental left and the anti-government right alike. But when it comes to the mismanagement of wild horses, the real villain is Congress. The BLM runs 177 “herd-management areas” across ten states. The animals are in truth feral, not wild—a few can be traced back to horses brought to the Americas by the Spanish, but most are descended from ranch stock or unwanted animals set loose during the 20th century. Lexington recently visited a herd in the McCullough Peaks of Wyoming—100,000 acres of desert badlands softened by pale, scented sagebrush, and cut through by canyons of pink-striped rock. To keep the herd’s population constant, a BLM officer, Tricia Hatle, injects between 50 and 60 wild mares each year with darts containing PZP, a contraceptive. This involves stalking the herds with a fearsome-looking gas-powered dart gun, capable of hitting a horse from 40 yards. Ms Hatle, an efficient sort, finished her darting in 18 days this year, down from several months a few years ago. The cost is $150 per horse, per year. That sounds reasonable—except that the McCullough Peaks herd comprises just 152 animals, out of 67,000 wild horses that roam public rangelands. The McCullough Peaks animals are also among the most accessible in the country, feeding and drinking near dirt roads open to the public. (Indeed, as Ms Hatle demonstrates her dart-gun, a retired baby-boomer in a low-slung sports car growls into view, asking where the horses are; the tourist is politely directed back to a tarmac road before he has to be towed out of a mud-pool.) Other herds roam across treeless tracts of states such as Nevada and would see agents from miles away. They would run long before they could be darted. Feral horses were once herded cruelly with airplanes or poisoned to stop them competing for food. But in 1959 a law promoted by a campaigner, Velma Bronn Johnston, also known as “Wild Horse Annie”, ended those practices. It was followed by the Wild and Free-Roaming Horses and Burros Act of 1971, which ordered the animals protected as “living symbols of the historic and pioneer spirit of the West”. Yet at the same time Congress told the BLM to keep public rangelands open for cattle-grazing and other uses, leaving limited room for feral horses. Bowing to public opinion, Congress has also shut down horse slaughterhouses in America. In 2015 a bipartisan group of members further tried to ban the export of horses for meat (steak de cheval is a delicacy in France). More cheerfully, as many as 8,000 wild horses used to be adopted out of BLM herds each year. But there is an oversupply of domestic horses—in part because of the closed slaughterhouses, and partly because rural folk are turning to all-terrain vehicles. Today the BLM struggles to find adoptive homes for 2,500 animals. Meanwhile, the National Academy of Sciences (NAS) estimates that the nationwide wild-horse population grows by 15-20% a year. In addition to the 67,000 horses roaming free, the BLM has moved 46,000 animals to corrals and to what the bureau’s director, Neil Kornze, calls “gorgeous green pastures in the Midwest”. Horses live longer on those rented pastures. Over the next 40 years, Mr Kornze calculates that those verdant retirement homes are “a billion-dollar commitment on behalf of the American public, in addition to the billion-dollar cost of horses on the range”. The bureau’s entire annual budget is $1.2 billion, of which over $80m is now spent managing wild horses—double the amount spent seven years ago. The BLM is pinning its hopes on research into new contraceptives, as well as into spaying and neutering. The bureau also wants Congress to make it easier to transfer wild horses to public agencies, such as the US Border Patrol. But the challenge may be larger than any technical fix. Historically, horses were seen as livestock, explains Mr Kornze. They are now “trending more into the pet category”. Last year a group of mostly western senators and members of Congress asked the BLM to outline different scenarios for bringing wild-horse numbers under control. Bluntly, none looks sustainable. In one, more than 160,000 animals would be added to BLM off-range corrals and pastures, for a 40-year cost of $4.6 billion. Another involves adding 15,000 horses to corrals and injecting up to 27,000 fertile mares a year with PZP. Senator John Barrasso of Wyoming, a Republican, says the BLM is between a “rock and a hard place”. The senator, a surgeon by background, sees no solution which does not involve some culling of wild horses. But public sentiment makes that unthinkable for most members of Congress, notably those representing urban and suburban areas. Several animal-rights groups even oppose transfers to pastures, arguing that the BLM should instead pay ranchers to move their cattle, freeing up vast new areas of the West for horses. Meanwhile, the wild-horse population is on course to double every four years (the NAS found little evidence that wolves or mountain lions keep herds in check). It is a revealing mess. Ask Congress to manage a few hundred thousand photogenic mustangs, and they try to spend their way to popularity. Small wonder welfare for humans is beyond reform.